Varmint hunters can now reap the benefits of Hornady Superformance propellant technology in their favorite varmint cartridges. 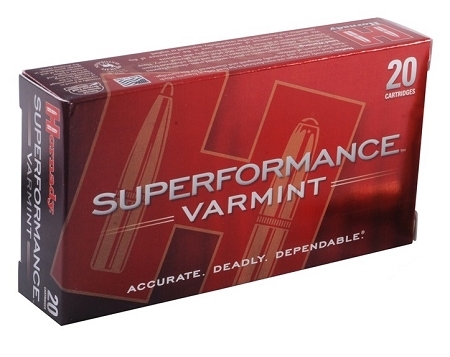 Superformance Varmint ammunition delivers muzzle velocity increases of 100 to 200 feet per second from EVERY gun. Accuracy, increased range, flatter trajectory, less wind drift and devastating terminal results are all realized with Superformance Varmint ammunition. Featuring the industry leading polymer tipped Hornady V-MAX bullet that delivers match accuracy and rapid fragmentation, Superformance Varmint ammunition from Hornady extends current varmint cartridge efficiency and performance. Optimal results are achieved in all firearms, and Superformance Varmint ammunition is safe to use in all action types, including semi-autos.